Infuse lovely fragrance into the Xiaomi Deerma LM09 humidifier can improve the quality of the air we breathe, which is perfect for relieving modern day stress and creating a comfortable and relaxed environment. Quiet 30db noise won't bother you or your family no matter you are sleeping or working, creating a quiet and relaxing environment. ● Concealed storage power cord, reasonable use of space. ● The height is the same as that of a mobile phone, can be easily put into a backpack and carried around. ● USB interface design, suitable for many occasions. ● With noise reduction technology, the running sound is ≤30dB. ● 7 colour changing LED light to create a serene atmosphere. ● Direct skin pores and moisturize skin with nano-scale water mist technology. 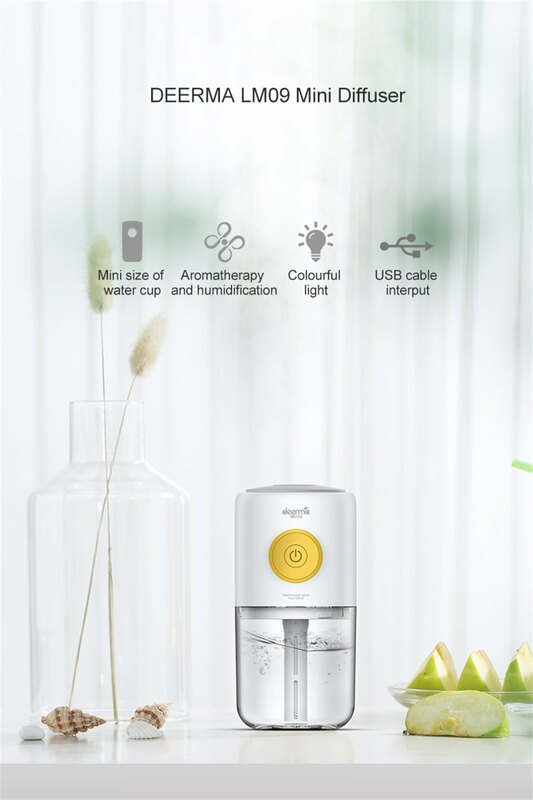 ● Ultrasonic technology to disperse essential oil to enhance aromatherapy and relaxation. ● 185ml capacity, with a maximum of 30ml/h of fog, only a cup of water, can moisturize for 6 hours.